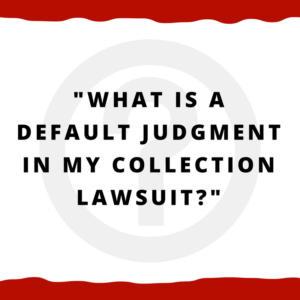 "What is a default judgment in my collection case?" What is a default judgment in my collection lawsuit? First, the collection suit is filed. Then, you’re served with the lawsuit, whether you’re given papers personally or it’s mailed to you via certified mail. Once you’ve been served, you have 14 days in Small Claims or District Court and 30 days in Circuit Court to respond. If you don’t file your answer before your time is up, then the collection company, whether that’s LVNV, Midland Funding, etc, will go to the court and file for a default judgment against you. They file this because you “defaulted,” or didn’t show up. This means that you lose. Well, if you have a default judgment against you, then the court has decided that you owe the money regardless. Think of it like the Super Bowl. If one team doesn’t show up, then the other team automatically loses. So we know Denver beat Carolina a few days ago. But what if Denver had not showed up — Carolina would have won. Maybe but you didn’t show up Denver, so you lose because you skipped out on showing up. Don’t “skip out” on filing your answer and get a default judgment. Make sure you file it. If you have any questions about how to answer your lawsuit, what you should do if you have a default judgment, or anything we may have covered in this article, feel free to get in touch with us. You can reach us at 1-205-879-2447, or you can fill out a contact form and we will happily get in touch with you to set up an appointment. PS — We have a very detailed video and article that goes over your five (5) options when sued by a debt collector (debt buyer) as well as answering many commonly asked questions.